Since the doors first opened in 1887 coffee and tea have dominated the shops atmosphere. Today, 128 years later, the Algerian Coffee Stores has evolved into one of the worlds best known and leading suppliers of coffee and tea. Offering a choice of over 80 coffees and 120 teas from around the world. The list continues to grow as they continue to source speciality coffee and teas from small corners of the world. They source original, delicious and fine confectionery. There is also a large variety of domestic coffee makers. The shop still retains some original features, the wooden shelves along the walls, the original wooden counter and display case. Ambala is one of the most prestigious confectionery and savoury brands in the world, known for the excellent quality of its products. 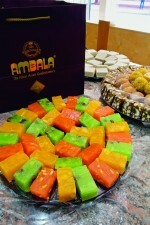 The range of Asian sweets on offer at Ambala vary from delicious after-dinner desserts to exotic confectioneries. From amongst the classical Asian sweets they offer include delicious Rasmalai, succulent Rasgulla mouth-watering Gulab Jamun, delicate Jalebis and delectable Barfis and Halwas, not to mention their exquisite Baklava. Not only is one of the best wholefood shops in London, it is also one of the cheapest. The vegetable section is piled high with shiny organic lemons and wooden boxes of freshly picked spinach and crisp fennel. You can also get refills for nature friendly cleaning products as well as luscious blueberry cakes, gentle hand creams and even organic pet food. They remain faithful to traditional methods and are still baking their bagels by hand, giving each one their full attention. Their outstanding team of chefs and pastry experts will provide you with the freshest breads, desserts and cakes as well as bespoke speciality cakes tailor-made to your every desire. They also offer a wide selection of finger food, light bites and platters for every occasion. This is a good place to ask about the provenance of each cheese and to find out about the best one for your particular palate. Or you can just drop by and pick up a soft ewe’s milk to spread on an oat cracker with a glass of red wine later on. It is no surprise that the shelves at the front of hits organic grocers are full to the ceiling with bottles of Chegworth Farm juices. Raspberries, pears, apples and beetroots are all pressed in small batches on their family-run fruit farm in the Kent countryside. You don’t have to go to Ivory Coast or Benin to stock up on bright yellow cotton printed with red prancing horses or a striking ABC pattern, fantastic fabrics can be found here in the East End of London. Their organic food shop is full of organic, vegetarian whole-foods and ecological household goods. They have a huge selection of organic fruit and vegetables, fresh bread, local honey, home-made takeaways, oils, dried fruits, organic champagnes, wines and beers, artisan cheeses, dairy produce, honey, toiletries, plus loose teas, coffees, nuts, seeds, beans, grains, herbs and spices, supplements, herbal and homeopathic remedies.